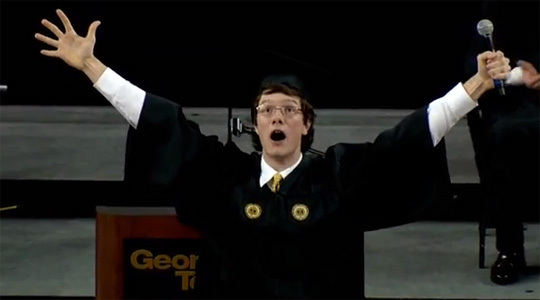 If you haven’t seen the video clip of the Georgia Tech Freshman convocation speaker that’s making the rounds, I highly suggest watching it. It’s priceless. “In the words of Sir Isaac Newton: “If I have seen further it is by standing on the shoulders of giants.” Georgia Tech is proud of its many traditions, but the one I find most exciting is our tradition of excellence. Our mission as students is not to follow in the footsteps of the astronauts, Nobel Prize laureates and president of graduated before us, but to exceed their footsteps. Crush the shoulders of the giants upon whom we stand. We here are all such innovative people. Previous Entry Drake University professor: Why aren’t white people obsessed with race like me? Indeed, it was a pretty great speech! He’s definitely got the mad genius engineer vibe going, but I like it. There are people in that crowd that will never forget that speech as long as they live, which I think is rather awesome. I like the guy. He’s manically possessed and that’s what you need to get in front of the pack these days. Far better than the grad speech we got from an executive woman from Nickelodeon who regaled us with singsongs and a puppet show. are you working on your post about Ben Affleck yet? my twitter feed went weirdly berserk today. “…While Georgia Tech’s recent convocation speech video continues to go viral, archetype copy of epic-labeled piece had surfaced out of the blue, only to degrade its novelty as well as sophomore student Nicholas Selby’s overnight reputation. Nicholas “Nick” Selby, a sophomore at Georgia Institute of Technology majoring in mechanical engineering, wowed everyone during the school’s convocation program; his welcome speech video not only gained million hits but also generated numerous comments and remarks through social media. Very interesting. I’d like to see the delivery of the original version. If he didn’t contact the original writer that’s not cool (to put it mildly), but his delivery was epic. He apparently stole it from his debate coach. Nothing wrong with appropriating humorous material though -0- It’s a tradition with comedians everywhere, and the guy did make me smile.